Ask any member of the general population to tell you something about classic Ferraris and you’ll probably get some combination of ‘Testarossa’, ‘Magnum PI’, and ‘that car from Ferris Bueller.’ Among auto-acedemics you’ll probably hear ‘250 GTO’, ‘F355’ and inevitably, ‘The Enzo’. These are all excellent and acceptable answers. But real Ferrari-philes, the diehard elitists, the old guard, they just may start their list with the 330 GTC. Update: I just added more pics at the bottom of the post and video. First seen at the Geneva Auto Show in 1966, the 330 GTC was the successor to the 275 GTC, gaining a bigger engine and an extra gear. 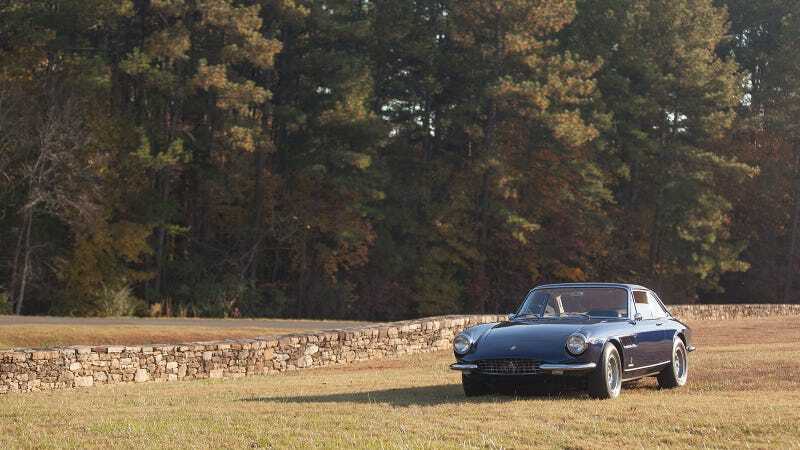 And while history has already proven the 330 GTC not to be the most famous, prettiest, or fastest Ferrari to fill the prancing horse stables, it is, in fact, an understated sleeper in the historic collection of a head turning automaker. Accents of past Ferraris can be seen in the curves of the headlamps and front fenders; nevertheless, the 330 GTC can easily be mistaken for a fastback Mustang in your rear view mirror, a visual trait it shares with the ‘72 Aston Martin V8. The 330 GTC was powered by a 4.0L V12 Colombo engine featuring three carburetors, and paired with Ferrari’s first five-speed manual gearbox. Output was heady for the day at 300 hp and 240lb-ft, numbers fairly unheard of in the late ‘60s on a street-legal production car. The 330 GTC employed independent suspension with unequal A-arms in the front and rear, allowing it to be as comfortable on long drives as it was athletic on the track. Ferrari tapped long-time collaborator Pininfarina for the 330 GTC’s coachwork, who sculpted a unique two-door coupe body to fit the short wheelbase of the 275 GTB. The 330 GTC added an oval grille and a rear end that was a modified version of the 275 GTS that aggressively set it apart from the pedestrian 330 America and the 330 GT 2+2. The power from the V12 coupled with the shorter wheelbase allowed for superior handling and a top speed of 145mph. The interior of the 330 GTC was designed to be graceful and luxurious. A high roofline meant fantastic visibility and the seats were crafted with comfort in mind, not just cornering. A simple dash built of real wood and filled with round gauges, toggle switches (for power windows, no less) conveys class and functionality all at once. To top it off, Ferrari’s signature ashtray bearing the crisscrossed Pininfarina and Ferrari flags sits directly alongside the long gear stick and the gated shifter. Having now experienced a beautiful ‘ground-up’ restored 1968 Ferrari 330 GTC like this one is a guilty pleasure that I hope to revisit. My favorite car memories have all but been replaced by the V12 gurgling at idle and howling at speed, the click-click of the gated shifter coming out of and back into gear, and the smell of leather mixed with the scent of hot gasoline wafting from the three carburetors. It all adds up to an afternoon that could never have a price tag. The thrill of owning an older Ferrari is not in keeping up with costly appearances or in showing the world that you have expensive tastes. It’s not about one-upping those neighbors across the cul-de-sac who just brought home another new Audi A8. These are both reasons why you buy a new Ferrari. The antique Ferrari offers you the thrill of driving an unbridled powerhouse of an engine, transmission, and braking system that seem utterly simple by today’s high-tech machines. The fury of all twelve cylinders being unleashed on the poor, unsuspecting radials makes the breathtaking experience come alive with a heightened sense of purpose, epic exhaust notes, and the knowledge that the adrenaline pumping through your veins probably won’t recede for a good three hours. That is why Ferrari has never been a car for the common people. It is a car for the select few who can afford and appreciate (not the same thing) the prancing horses for what they are— masterpieces. All photos are ©2013 IDM Photography LLC but feel free to download them for desktop wallpapers. If you reblog them, please be kind and drop a link back to this post or to IDM Photography directly.